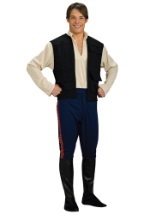 Help Yoda escape the Jedi assassination order in our elite adult Chewbacca costume. The Wookiee costume is covered in synthetic fur and ties together behind the neck. The back closes with a Velcro strip. A bandolier with a pouch to hold your personal belongings and a fully-detailed vinyl mask complete this costume’s authentic look. Match this deluxe Chewbacca costume with a pair of our Chewbacca hands to go Wookiee from head to toe this Halloween.